Some collectors wait years for something like this to turn up: a pristine, original 1963 Shelby Cobra. Chassis number CSX 2080 has been sitting untouched since 1981, and has had only two owners in its history. And now it's going up for auction. 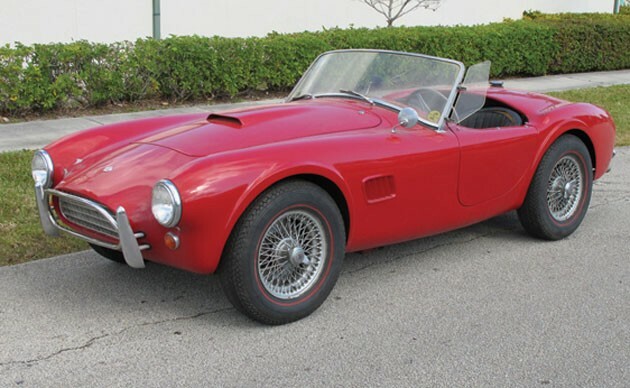 The headline consignment for the Collector Cars of Fort Lauderdale event held by the newly rechristened Auctions America by RM, this Cobra could very well be the find of the new year. Its body and interior are in remarkable condition for a car this age, and the original factory powertrain recently underwent a complete overhaul - kind of a necessity for a car that's been sitting still for nearly thirty years. Pre-sale estimates place it around $425,000 (give or take a quarter-k), joined by such early consignments as a '32 Duesenberg, a 1969 Shelby GT500 Fastback and a 2005 Ford GT. The event takes place at the Broward County Convention Center on March 3-5, but you can scope out the details in the press release after the jump, along with the photos in the gallery below, right now. Shelby Cobra barn find up for auction in Fort Lauderdale originally appeared on Autoblog on Thu, 13 Jan 2011 14:01:00 EST. Please see our terms for use of feeds.